During ancient times, Greece served as a geographically strategic meeting place for people from Europe, Africa, and Asia. Today, the country remains as diverse and vibrant as the cultures that shaped it. Athens emerged during the Classical Age, in the 5th century BC, as the most prominent city-state in Greece. It is located in the southernmost region of Central Greece, and is the port city where most begin their tours of the popular Greek islands. It is situated in a basin surrounded by four mountains: Mt. Hymettos to the east, Mt. Parnis and Mt. Aigaleo to the West, and Mt. Pendeli to the north. It is home to countless archeological sites, museums, and social attractions. Greek is the language spoken here, although as in most places, English is also spoken and understood. Currency in Greece is the drachma. To Greeks, Athens is an overcrowded, expensive, and decadent place to avoid if you are the quiet, peaceful type. 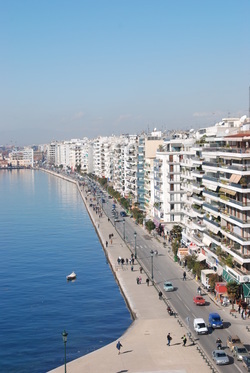 To tourists, however, Athens is an exciting, bustling city filled with shops, cafés, monuments, and character. Although pollution and traffic do add to the grit of the city (think New York's traffic jams and Los Angeles air quality), the energetic tourist will find plenty of opportunities for sightseeing. While Greeks like to ridicule Athens, 40% of the country's population lives here, and 5 million people can't be wrong. The street congestion is partially alleviated by a newly constructed subway system called the metro, but taxis are still the primary mode of transportation for visitors. And although Athens is a modern city, the history and antiquity of Greece is not entirely forgotten here. The city is home to many places that recall Greece's achievements in science, sport, architecture, and art during from Classical Age. It boasts of relics from the Greek, Roman, and Byzantine periods. History enthusiasts will want to visit the Natural Archeological Museum. And no one who visits Athens should miss the city's most impressive legacy, the Acropolis and the perfection of the Parthenon. It is an architectural must-see, looming 200 feet above the city. Just as Athens offers plenty to do, it also offers plenty of places to unwind. Traffic jams and overcrowding can be quickly forgotten while enjoying appetizers at a local restaurant or sipping coffee at a tranquil side street café, as Athenians are also masters of food, friendly debate, discussion, and relaxation.